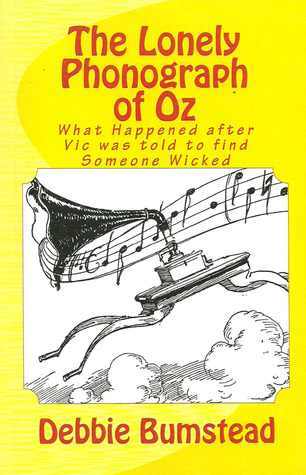 The Lonely Phonograph of Oz, by Debbie Bumstead – Victor Columbia Edison, the phonograph who was accidentally brought to life with the same powder as the Patchwork Girl, only appeared in The Patchwork Girl of Oz for some brief comic relief and musical criticism. Fans have taken to this character, however, with his making appearances in several unofficial Oz books. Perhaps most notably, Carrie Bailey’s Bungle gives him a partner in Dr. Pipt’s animated three-legged stool. He also shows up in Greg Gick’s Bungle and the Magic Lantern and Dennis Anfuso’s Astonishing Tale of the Gump. In this book, a girl named Lacey Moore travels to Oz in her great-grandmother’s chair, which turns out to be magical, with the specific intention of helping Victor. He’s been wandering around Oz for years, annoying various individuals and communities with his music, and then making it sound like they were nasty to him for no reason. It’s mostly episodic, with Victor and Lacey visiting characters whom the phonograph claimed were villains, only to find them actually quite kind. Meanwhile, a couple known as the Choc-chips find an old map that they think places Ozma’s palace on their land, and seek to take control of it. It’s a kind of ridiculous plot device that requires the Choc-chips to be rather clueless. It’s not one of my favorite recent Oz stories, but the characters and locations are fun and creative, and it’s nice to see a happy ending for poor Victor. The Oz-Wonderland Chronicles: Prelude, by Ben Avery and Casey Herring – I thought I believe I’ve read all of the main series for this comic, as well as some of the spin-offs, but the numbering can be a little confusing. When I saw this one at the Oz Convention, I knew I hadn’t read it before. Published in 2013, it’s a prequel to the main story, featuring a girl named Sarah Helms who has inherited the ability to travel between worlds from her mother. She travels through Oz and Wonderland with a shape-shifting raven companion, later joining forces with the Frogman as well. Her story overlaps with that of Dorothy and Alice, as Sarah’s mother is in the same hospital as Uncle Henry. As with the rest of the series, the art is quite adept, largely based on John R. Neill and John Tenniel, but with a more modern look and a few nods to the movie versions. Also included in the volume are a prose story about what the Wizard of Oz had been doing after he and the other Americans left the fairyland, and an Oz-Wonderland Kids comic that I don’t believe had been published before. The latter greatly simplifies the crossover idea, having the White Rabbit stumble into Oz and bring Dorothy back to Wonderland, where she and Alice work to prevent a team-up between the Queen of Hearts and the Wicked Witch of the West. The framing is rather curious, as the Wicked Witch is still alive, suggesting that Dorothy is still on her first visit to Oz. It’s actually canonical that the Cowardly Lion doesn’t like tea. It’s a funny story, with gags based on both fantasy worlds. While intended as a stand-alone, there is a sequel hook. And that’s a pun I didn’t realize I’d made at first, as it ends with a cameo by a certain one-handed pirate. The art matches the light-hearted, comical style. Sean Carlson, The Songs of L. Frank Baum’s Rinkitink in Oz – I’ve long thought someone should set the songs in the Oz books to music, and thought I might do it myself if I had even the slightest iota of musical knowledge or ability. Well, someone has done it, at least for the songs sung by King Rinkitink. Sean, son of OzCon co-chair Karyl Carlson, composed and played the music, using mostly midi instruments. I generally had a little bit of a tune in my head when I read the songs in the book, and while it was probably a combination of things, the one I had for “The Merry Maiden” and “Dead Red Head Ned” was quite reminiscent of the Lonely Goatherd song from The Sound of Music, although it was a while before I realized this. Carlson’s takes vary a bit in style from complexity, going from fairly straightforward melodies to rather intricate, jazzy ones. “Fizzy Fezzy Fuzzy” has a bit of a doo-wop sound, and “An Avus’ Aria” features midi upright bass and banjo. The appropriately martial “The Army of the King” adds a few amusing lyrics of Carlson’s own, and there are occasional nods to other musicians. Most notably, “Farewell Dear Isle of Pingaree” has a bit of “Over the Rainbow” towards the end. This entry was posted in Albums, Authors, Book Reviews, Characters, Comics, Dennis Anfuso, Humor, John R. Neill, L. Frank Baum, Lewis Carroll, Music, Oz, Oz Authors and tagged alice in wonderland, ben avery, bungle and the magic lantern of oz, bungle of oz, carrie bailey, casey herring, cowardly lion, debbie bumstead, dorothy gale, frogman, greg gick, john tenniel, king rinkitink, oz-wonderland chronicles, queen of hearts, rinkitink in oz, sean carlson, the astonishing tale of the gump of oz, the lonely phonograph of oz, the songs of l. frank baum's rinkitink in oz, victor columbia edison, wicked witch of the west. Bookmark the permalink. Thanks for the reviews on these. I’ve had Lonely Phonograph sitting on my to-read list for some time. I’ve been curious to see if it could be made to fit in with his other appearances (that you mentioned). The Oz-Wonderland series has really been fun, but yes, their numbering system is a little more challenging to follow than it should be. Lately, I just pick up the graphic novels and read them that way, as my local comic book shop tends to forget to put Oz comics on the side for me (probably because their publication is so sporadic). Have you been reading Donald Abbott’s How the Wizard Came to Oz comic-strip? It’s great!! I wondered that about Lonely Phonograph as well. The only real hint as to time period seems to be that Lacey’s great-grandmother had bought a chair from the Wizard of Oz. It was probably intended to take place around when it was written, which I think was sometime in the nineties, but there’s probably some wiggle room. I suppose it would likely occur before either of the two Bungle books. I’ve been meaning to read the comic, but I keep forgetting. I’m quite disappointed as you neglected to mention that Victor Columbia Edison plays a fairly significant role in The Emerald Slippers of Oz, Amanda and I’s first co-written book together. I can’t say I’ve read that one. Then I cordially invite you to read it. The Emerald Slippers of Oz even includes an Introduction by Roger Baum.